The Christmas bug bit me. My tree is up, the Christmas plant that I talked about recently is still standing (it's a Christmas miracle! ), little red bows and colorful ornaments are hanging from light fixtures and festive centrepieces are carefully placed on the dinner and coffee table. To bring it all together, I decided to make our home smell festive too. I went to Bath and Body Works and decided to stock up on the season's "wallflowers". I smelled them one by one and finally chose THE perfect Christmas smell (did you know Christmas had a smell?). 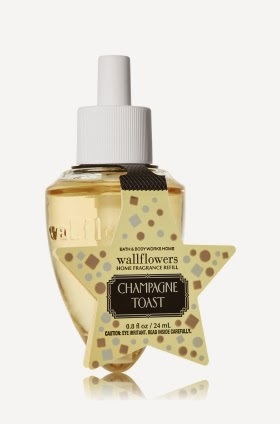 It's called Champagne Toast and not only did I fall in love with the smell, I fell in love with the name as well. I returned home and quickly plugged it into the wall of our kitchen. I could suddenly picture merry Christmas and New Year parties in our house surrounded by happy people and overall jubilance. My love affair with my "wallflower" was coming to an end faster than I thought. The smell wasn't enchantingly taking over the house as I wished it would and I felt like I had to practically stick my nose to the diffuser in order to smell my Champagne Toast. I returned everything back to the store today (they have excellent customer satisfaction policies!) 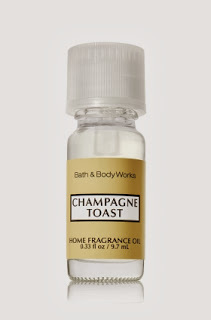 and got a Champagne Toast fragrance oil instead (the one under which you have to light a candle to warm it so the smell diffuses). I came home, lit a candle under the oil, lit up my tree and started to cook surrounded by merriment. Perfect, comforting winter food was on the menu: Cauliflower Potpie! Long story short, as I sit here and blog, I can't smell my Champagne Toast... I can't smell potpie either... I can smell burnt food. Not long after I put the food in the oven, smoke started to come out of its narrow openings. I quickly opened the oven door and suddenly, the whole room filled with smoke. I must have looked like I was doing an awkward rain dance as I frantically waved a kitchen towel under the ringing smoke detector (it rang twice!). I thought "why is this happening? I'm no chef but I know how to cook!" Turns out, some sauce had dripped in the oven and the drippings were burning. Luckily, dinner wasn't burnt at all and it was very tasty! (P.S. The smell of the oil filled our home delightfully). 2. In a large pot, melt butter over medium-high. Add onion and carrots and cook until softened, 8-10 minutes. Add garlic and cook for about 30 seconds. Add flour and stir to coat vegetables. 3. Slowly add broth, whisking constantly until sauce is smooth. Add the milk (or cream). Bring to a boil, reduce heat, and simmer until thickened (about 6-7 minutes). Stir in the frozen peas. Season with salt and pepper, then stir in the boiled cauliflower florets. Pour filling into a baking dish or a dutch oven. 4. On a floured work surface, roll out puff pastry dough to 1/8-inch thickness. Place the dough over the dish and fold the overhanging parts inward while pinching to crimp edges. Cut a few slits in the dough. Place it on a baking sheet (to avoid doing the "smoke dance" like I did!) and bake until crust is golden brown and filling is bubbling around edge (approximately 40 minutes). Let cool 15 minutes before serving.